You are currently browsing the archives for the day Thursday, February 15th, 2018. I love Valentine’s Day and always enjoy prepping the ultimate outfit. While classic reds and pinks are a quintessential choice, I’m loving the subtle hearts and little pops of color. The unexpected message on the Dolce box bag will definitely steal your heart! 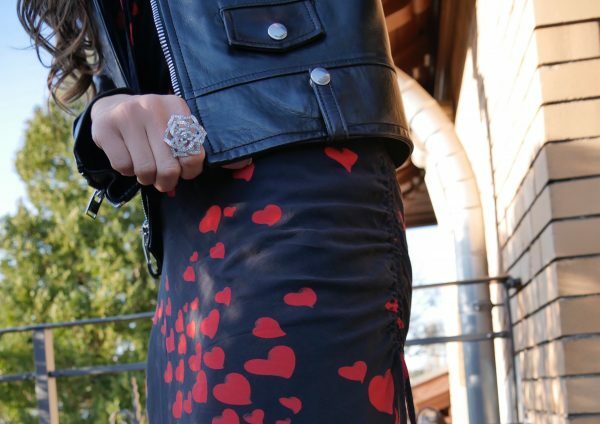 My look: Perfecto leather biker jacket and Janis leather platform pumps with chains, both by Saint Laurent , vintage heart print chiffon dress by Moschino Cheap & Chic, printed metallic leather box clutch by Dolce & Gabbana, heart shaped earrings by Chanel and rose diamond ring by Piaget. Don’t forget to enter the Valentine’s Day contest with Dyson!